Special characters stand out. They’re a step between troopers and heroes – distinct, powerful game changers. Special characters break stalemates at choke points, leap over enemy lines to launch surprise attacks, and flush foes out of hiding with streams of liquid flame. Alongside vehicles, they’re part of the new reinforcement system, fueling ever-escalating stakes and increasing tension in every battle. 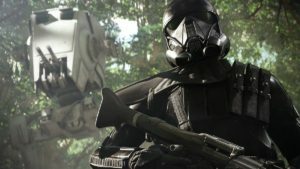 Come back to Gaming-Fans.com for all your Star Wars Battlefront 2 news, and may the Force be with you!